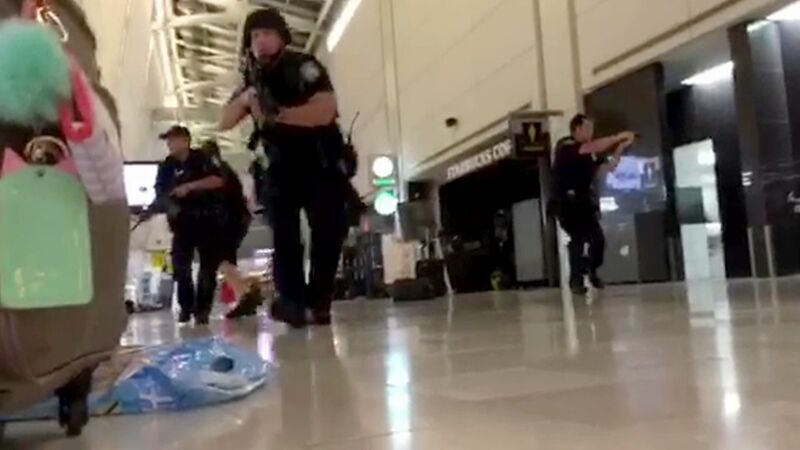 JAMAICA, Queens (WABC) -- Video obtained by Eyewitness News shows tense moments inside New York City's JFK Airport after reports of shots fired inside one of the terminals. The ordeal, which started at about 9:30 p.m. in Terminal 8, prompted an airport-wide ground stop and the shut down of Terminals 1 and 8. Later, the Port Authority said no shots were fired what led to the panic is under investigation. The clip recorded by someone at the airport shows officers with guns drawn yelling for people to get down. Alarms can also be heard going off in the background, as well as people screaming. Watch video showing the tense moments after gunshots were reported inside JFK Airport in New York City. They Port Authority requested assistance from the NYPD to investigate the matter.